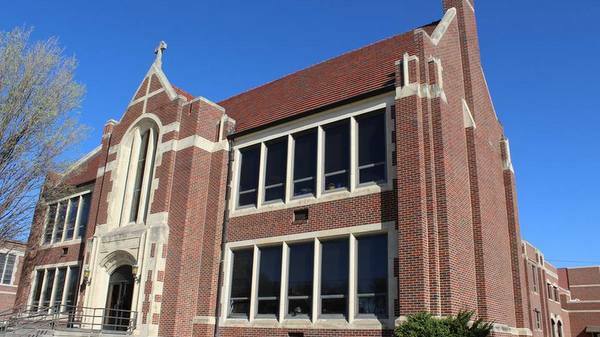 Blessed Sacrament Catholic School provides excellence in education, preparing each child to learn, love and witness the teachings of Christ. Blessed Sacrament Catholic School provides excellence in education, preparing each child to learn, love & witness the teachings of Christ. Want a Better Prayer Life? New this year!! Book studies groups by grades. In addition to learning about prayer, study groups within classes have the added benefit of helping us grow in our relationships with each other, with our child’s friends’ families, and thus foster a sense of community within our class. This and so much more can be gained by participating in a book group. Also, new this year...A family study guide with activities designed to be used with the entire family or with other families. 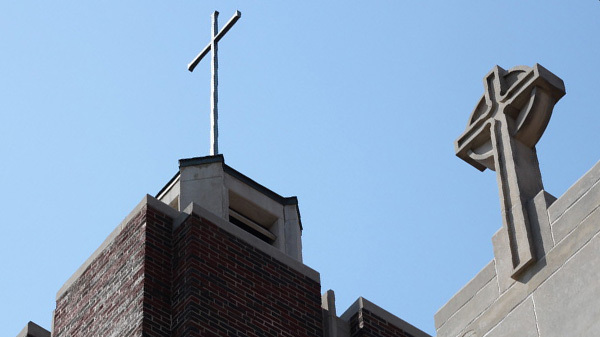 To learn more about any of these opportunities, please click HERE so we can contact you with more information or call the parish office at 316-682-4557. 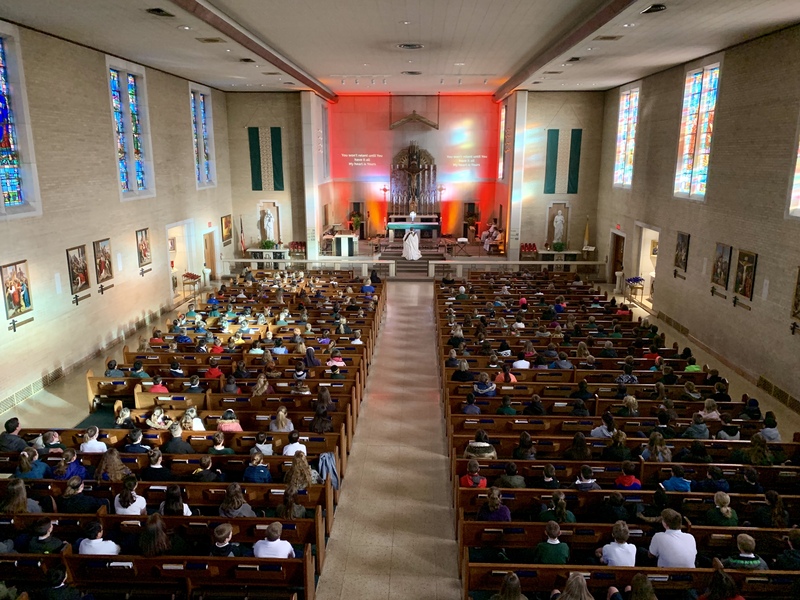 Thank you for prayerfully considering being a part of this all-parish/school effort to help us all grow in our prayer life! 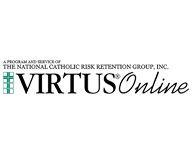 Support our school by Registering your Dillon's Shopper's Card & through Amazon Smile! Pep Rally Featuring our Future Cheerleaders! 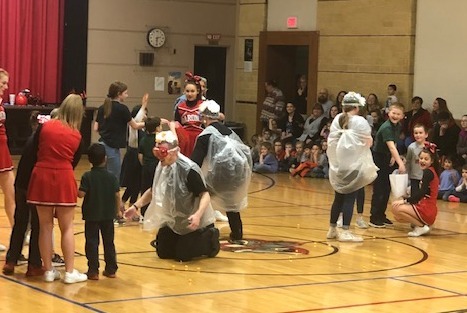 We had a wonderful time Friday afternoon during our Pep Rally featuring our future cheerleaders who showed us what they learned during their mini cheer clinic. 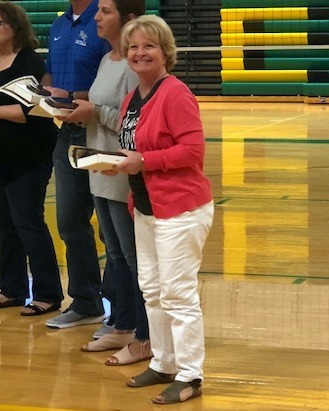 A huge "thank you" to our cheer coach, Miss Katie Brinkman, and all of her wonderful helpers as well as this year's 8th grade cheerleaders for making it an enthusiastic Pep Rally with lots of fun had by all! 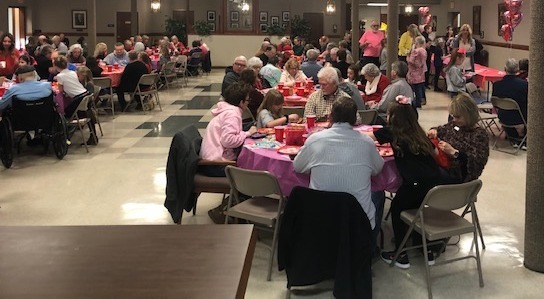 Our annual 3rd grade Grandparent Valentine's Bingo was a huge success! 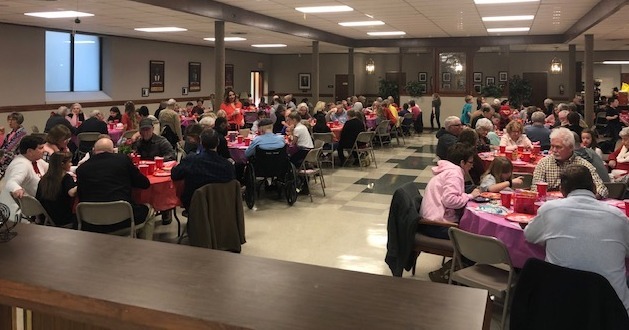 Fun was had by all with much laughter and sweet treats shared with students and grandparents grand-friends. Blessed Sacrament Catholic School will be closed Thursday, February 7th. 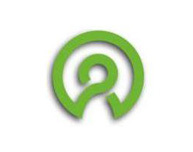 Parent/Teacher Conferences for Thursday afternoon have been cancelled as well. 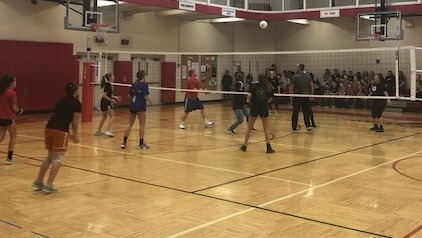 We had our annual Student versus Faculty Volleyball game to conclude our events for Catholic Schools Week! The cheering was loud and the competition was steep! 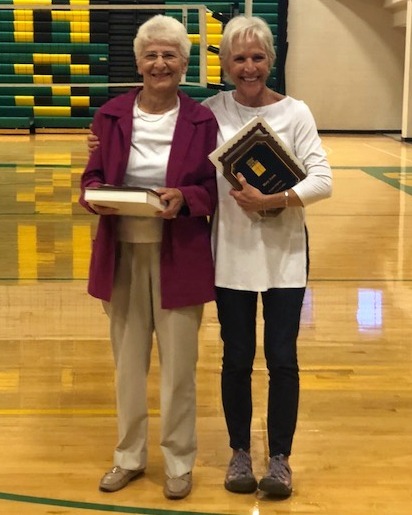 The students took one game, but the faculty took the other, so let's call it a DRAW! Good luck next year! 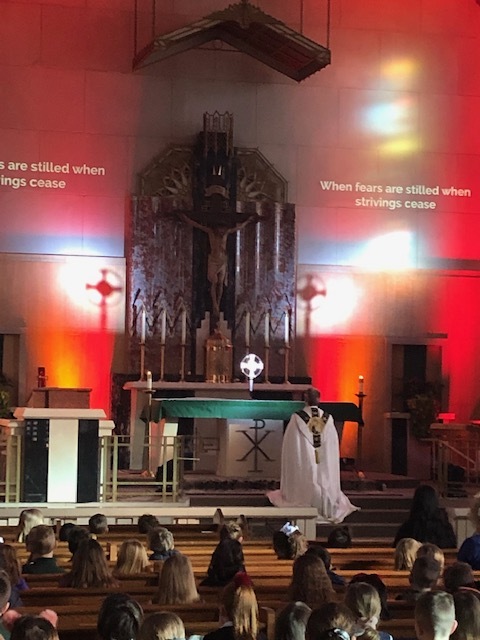 Following an All School Mass, the Wichita Adore Ministry led our school students and faculty in a beautiful Eucharistic procession and adoration in the church for Catholic Schools Week. 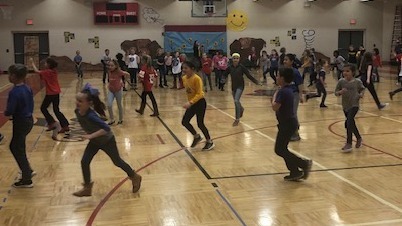 Our 2nd and 3rd Graders "wow'd" the crowd with their rendition of good ole' Kansas Day songs for this 2019 Kansas Day Music Program held Tuesday, January 29th. Way to go! Congratulations to our Catholic Schools Week Religion Bee Winners! 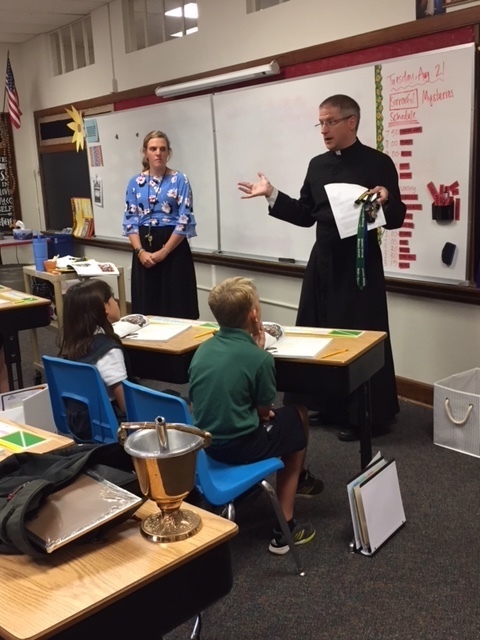 During Catholic Schools Week we held a Religion Bee on Monday, January 28th. 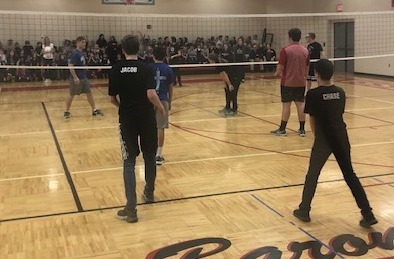 Students were chosen from all grade levels 1st through 8th and were divided into 4 teams with each grade level represented in each of the teams. The winning team was: The Crusaders! 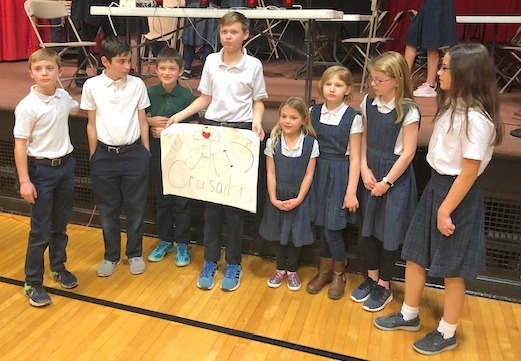 The Crusaders consisted of the following students: Brigid McDonald, Ivy Oatman, Beckett Romain, Cate Luttrell, Roman Scognamillo, Konnor Bruening, Mayra Nichols, & Nate Hesse. Way to go to all of our wonderful religion bee participants! We are proud of your effort! Our Intermediate and Middle School Students enjoyed a fun-filled day participating in their annual Christmas outing. 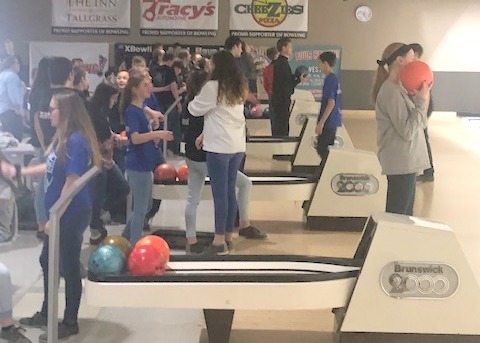 Our 8th graders enjoyed the afternoon at the Northrock Bowling Alley. Our 7th graders enjoyed the afternoon on the ice at Wichita Ice Center, 6th graders bounced to their hearts' content at Aviate Trampoline Park and our 3rd-5th graders skated round and round at the Carousel Skate Center. The general opinion was that fun was had by all! 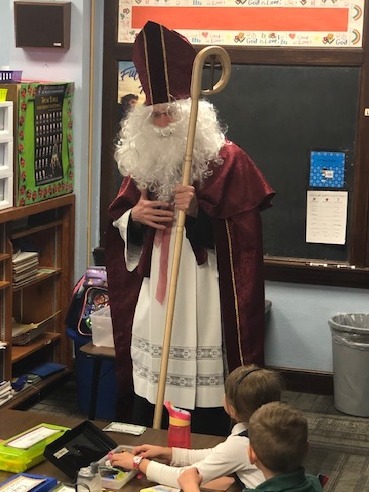 St. Nick visited our classrooms on December 6th! 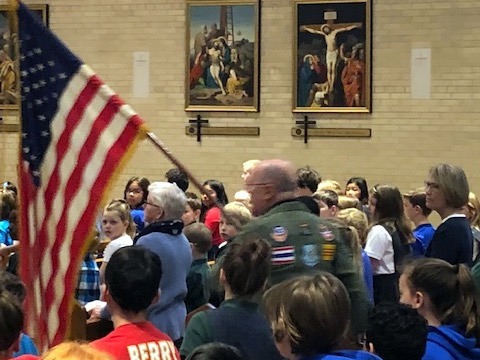 We had another wonderful Veteran's Day celebration this morning for our beloved veterans! 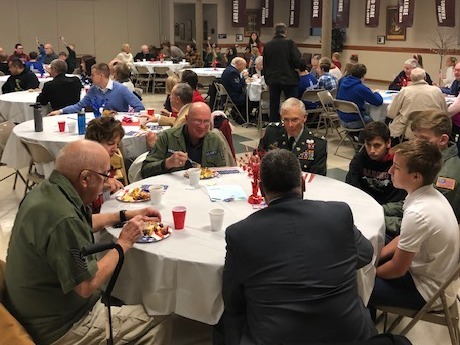 We wish to thank our faculty, Mrs. Sharla Canada, Mrs. Bev Gipson, Mrs. Mary Jones, and Ms. Catie Rudisill, for the planning of this special day, Kelly McCague for organizing the breakfast that is served to our veterans, as well as the many parents and stewards that provided the scrumptious goodies that were enjoyed by all. We want to especially thank all of our veterans for the giving of themselves in the protection of our country and each of us! May God bless you and all of us! Police Department says "Thank You"! 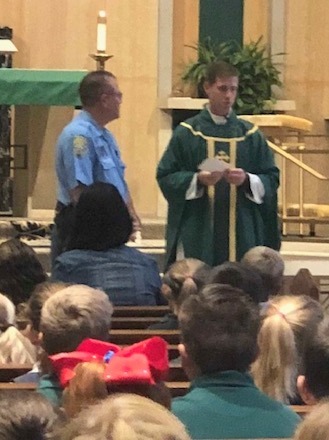 Sheriff Easter along with two other law enforcement personnel came to our all school Mass Wednesday, October 3rd to say "thank you" for the money we raised for Deputy Kunze's family. 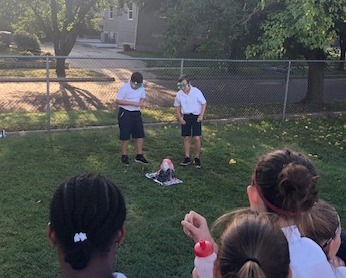 Sixth grade science students in Ms. Saubers’ class erupted with new knowledge of volcanoes. Students researched online the different types of volcanic eruptions such as a pyroclastic eruption which is the most explosive and dangerous to people. It blasts hardened lava, toxic gases and smoke. An “everyday” volcano spews out molten lava. All student volcanoes were erupting on the playground in varied colors and heights, including a pyroclastic (high—not too dangerous) eruption. Safety glasses were worn by all, practicing safe science procedures. 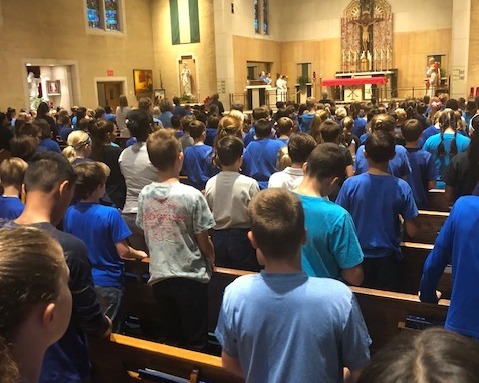 Blessed Sacrament Catholic School hosted a special "Back the Blue" jeans day on Friday, September 21st, 2018 to show our support of the family of Deputy Kunze and all law enforcement officers. We collected donations for Deputy Kunze's family which totaled: $1,591.87. Thank you to all that participated in this special event. We are proud to have these wonderful teachers and staff here at Blessed Sacrament! Fr. Drew is making his way around to Consecrate each classroom to the Sacred Heart. 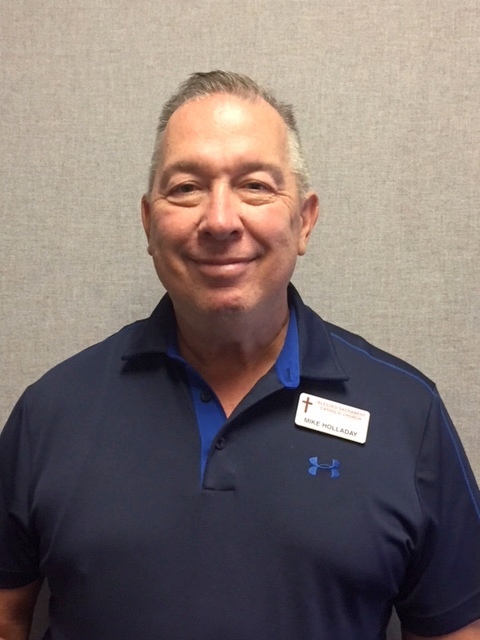 FACILITIES COORDINATOR (HEAD MAINTENANCE) - Mike Holladay - Mike assumed the responsibilities of Facilities Coordinator effective Tuesday, June 5th. 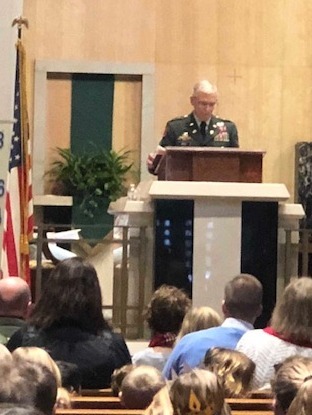 Mike has been a parishioner of Blessed Sacrament for 30+ years and looks forward to working with the parish, school staff and all of our parishioners. 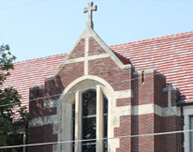 We are a vibrant parish and school with lots of activities and events. Mike plans to use his 25+ years of experience of facilities management to help coordinate, plan and maintain to ensure all needs of the campus are met. Welcome, Mike! 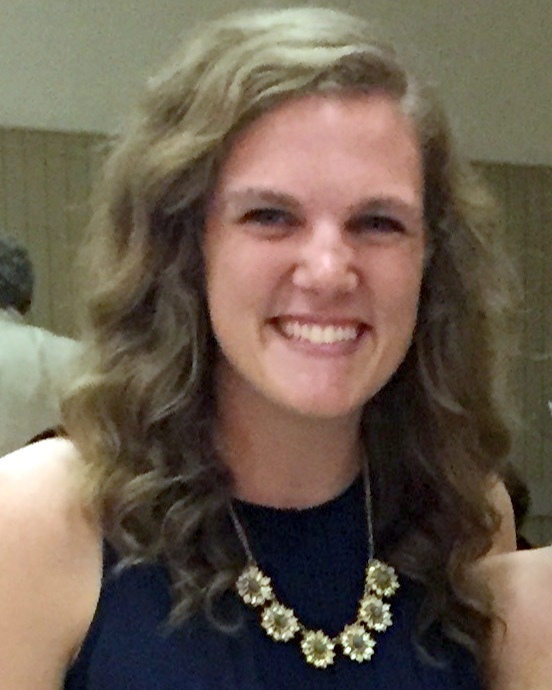 FIFTH GRADE TEACHER - Miss Abigail Donart - I am so excited to be starting at Blessed Sacrament this year as the new 5th grade teacher! 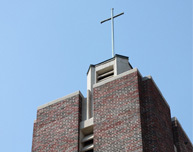 I graduated from Kansas State 2 years ago and have been teaching religion in Junction City since. I am pumped to be moving to Wichita and enjoy running, bike rides, books, movies, and playing any sport. Can’t wait to see what this year holds, go Barons!